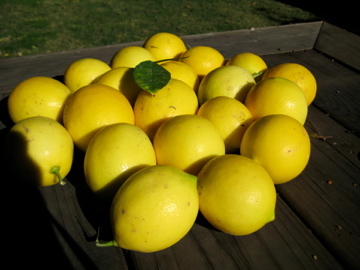 Dozens of plump, yellow fruit are weighing down the boughs of the meyer lemon tree in my garden. For the past week, I’ve picked over twenty lemons. When it came time to decide what to make for Thanksgiving dessert, I felt I didn’t have much of an option. Whatever I made had to be citric in a major way. 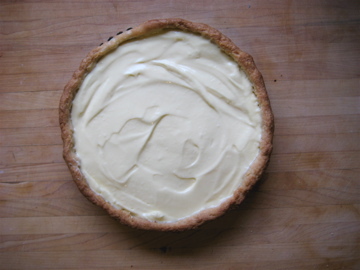 Dorrie’s Lemon Cream Tart was the obvious choice. I’m glad I choose it, but I don’t think I ever worked so hard. If I hadn’t made a lot of avgolemono soup years ago, I am sure I would have made a mess of this recipe. Whisking egg yolks over heat takes stamina, dexterity, and concentration. Is it worth it? The short answer is yes. The long answer comes at the end. Getting ready: Have an instant-read thermometer, a strainer and a blender (first choice) or food processor at hand. Bring a few inches of water to a simmer in a saucepan. Put the sugar and zest in a large heatproof bowl that can be set over the pan of simmering water. Off the heat, rub the sugar and zest together between your fingers until the sugar is moist, grainy and very aromatic. Whisk in the eggs, followed by the lemon juice. Set the bowl over the pan and start stirring with the whisk as soon as the mixture feels tepid to the touch. Cook the lemon cream until it reaches 180 degrees F. As you whisk — you must whisk constantly to keep the eggs from scrambling — you’ll see that the cream will start out light and foamy, then the bubbles will get bigger, and then, as it gets closer to 180 degrees F, it will start to thicken and the whisk will leave tracks. Head up at this point — the tracks mean the cream is almost ready. Don’t stop whisking or checking the temperature, and have patience — depending on how much heat you’re giving the cream, getting to temp can take as long as 10 minutes. As soon as it reaches 180 degrees F, remove the cream from the heat and strain it into the container of the blender (or food processor); discard the zest. Let the cream stand, stiring occasionally, until it cools to 140 degrees F, about 10 minutes. Turn the blender to high (or turn on the processor) and, with the machine going, add the butter about 5 pieces at a time. Scrape down the sides of the container as needed as you incorporate the butter. Once the butter is in, keep the machine going — to get the perfect light, airy texture of lemon-cream dreams, you must continue to blend the cream for another 3 minutes. If your machine protests and gets a bit too hot, work in 1-minute intervals, giving the machine a little rest between beats. into the sugar and zest and began whisking. From this point on, I whisked constantly. My arm ached. It took quite a bit longer than 10 minutes to thicken the custard. And whisking with one hand and holding the thermometer in the other was uncomfortable. Whisking, whisking, WHISKING, I watched the egg custard become frothy like eggnog and then thicken. But damned if I could get the heat up to 180 degrees! I turned the heat up a little at a time, but I never got it hotter than 160. Fortunately, it seemed sufficiently thickened after 15 minutes of whisking. I decided to go with my gut. Straining, too, wasn’t as easy as Dorrie made it sound. For the first time in my life I wished I had a chinois with a pestle instead of the inexpensive, fine-mesh sieve I used so awkwardly. After plopping a big dollop of custard in the strainer resting on the blender container, I used a silicone spatula to mush it through the mesh. I had to use a knife to scrape off the strained cream on the bottom of the sieve. Another dollop, and then another. By the time I had smushed all the custard through the sieve into the blender, the temperature of the custard was, if anything, a little cooler than probably was good for it. The custard filled about a little less than half of the blender container. I dropped in the butter and turned on the blender. By the middle of the second stick, I didn’t need to prod it down. The cream was now swirling on its own. I let the blender run for a while. When I sampled the cream, I realized what the fuss was about. Since I planned on taking it with me to Oakland for Thanksgiving dinner, I transfer the cream to a plastic container, pressed plastic wrap on the surface and placed the top over that. Into the fridge it went. When I assembled the tart, I did not have to stir it up. It spread smoothly over the pastry dough. My only regret is that I didn’t leave it in the fridge right up to the moment when we served it. This tart deserves to be served chilled. What appears in the photo above is the tart nearly at room temperature, which is too warm. That’s it for Dorrie for the time being. Aside from not wishing to push the fair use of her book too far, I need to avoid desserts for the time being. I’m sure you’ll agree! Oh just to have access to the Meyer lemon regardless of how this recipe would turn out! Moved from n.ca to INDIANA and miss my neighbors huge tree! Any time you want to share, I’ll trade my chestnuts, pawpaws, or anything midwest with you!!! Teri, thanks so much. I can well imagine how you miss Meyer Lemons. And I would have sent you some a month ago when I had too many to deal with! But, alas, they’re gone. Funny you mention chestnuts. After spending Christmas in London and eating roasted chestnuts, I began to wish I had easy access to them. There must be lots of things to do with chestnuts. Maybe we can arrange a swap next fall. Just made this today and didn’t strain it–turned out great!